Eris is a dwarf planet that lies at the outer reaches of our solar system. It was discovered in 2005 by professional astronomers who were examining images taken at California's Palomar Observatory two years previously. As a dwarf planet, it fulfills most of the criteria for being a planet with the exception that it doesn't have the gravitational pull, because of its size, to clear space surrounding it of other celestial bodies. It was previously known as UBU 313 and nicknamed Xena before it was given its current name. The International Astronomical Union (IAU) is responsible for naming and classifying planets. Eris has a diameter of 2400km, which is slightly larger than Pluto's. In comparison, the Earth's diameter is 12,742km. Neither planets nor dwarf planets are perfect spheres, so this isn't the ideal way to measure their size but it is a reliable indicator. It takes Eris almost 557 years to orbit the Sun and it lies 97 times further out from the Sun than the Earth (defined as 97 astronomical units - 97 AU) when at its furthest. It has a highly unusual, eccentric orbit, which means that at its closest Eris is only 38 AU from the Sun. So at some times it is closer to us (and the Sun) than Pluto is. Because it is so distant from us, we cannot observe Eris with the naked eye or even binoculars in the same way as you can planets such as Mars or Jupiter. You'll need a very powerful telescope and plenty of amateur astronomy experience to view it, so don't expect it to be featured in our sky guide any time soon! 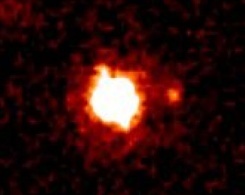 Dysnomia is a small moon of Eris that takes around two weeks to orbit its parent dwarf planet. It's about 8 times smaller than Eris. Astronomers are currently studying the relationship between Dysnomia and Eris. A better understanding of how they interact will enable them to pinpoint the mass of both the dwarf planet and the moon. When its diameter was established (through observation in 2005) a conundrum arose for astronomers all over the world. Was it the tenth planet? If not, then what justification was there for Pluto retaining its planetary status aside from the fact ordinary people regard it as a planet? It was decided by the IAU in 2006 to reclassify both Pluto and Eris as dwarf planets. This decision was controversial but will keep the number of full planets steady should we discover any more large but distant solar system bodies in the future.